No plans on Valentine’s Day? Escape the awkward first date, and go on WZND’s Date of Eight! 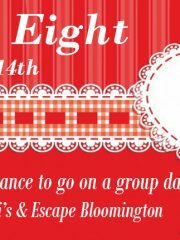 WZND wants to send you on a group date on Valentine’s day! The night will start with a dinner courtesy of Avanti’s, and end with an escape room! Simply fill out this application to be considered!